In the love of God you should either make no efforts, or you should love the efforts themselves. If you are good, my Lord, / to the soul who seeks you, * / how much more to the one who finds you! In Berlin, on […] 15, 1713. Johann Daniel Schmidmann (Schmidtmann) had his origins in Pfalz, in the region of Mannheim. He was born in 1663. He was pastor at the army of Kurpfalz, then member of the Prussian Royal Council, and pastor of the Reformed church of Berlin. He died in October of 1728. His works include, besides a number of sermons: Die nach der herrlichen Freyheit der Kinder Gottes seuffzende Creatur … Berlin, 1717. – Beruf und Erwehlung zur Seligkeit. – Lobwassers Psalmen. – Letzter Schwanengesang. 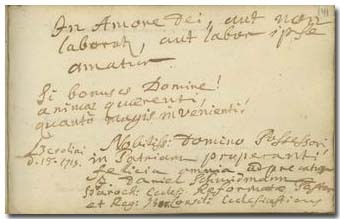 Although Schmidmann does not indicate the month of his note, he probably did it at the same time when the other three persons of Berlin, Gundelsheimer, Sterky and Paul Ernst Jablonski (pp. 387, 143, 361), that is, in July or August of 1713.